Main Street Junction in Breckenridge CO Real Estate are in-town condos with great Breckenridge Ski Area and in-town, village views. 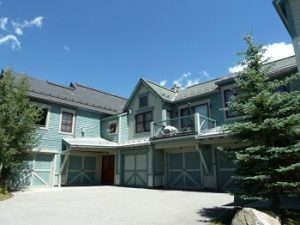 Located on the south end of Main Street Breckenridge these condos have great access to all the restaurants, shops and skiing but still have a private feel. Built in 1999 there are 36 condos in Main Street Junction. There are 6 – one bedrooms, 12 – two bedrooms and 18 – three bedroom condos located on either the first or second floor. Main Street Junction condos range in size from 706 – 1334 square feet. The majority of the Main Street Junction condos in Breckenridge Colorado come with a detached, heated 1-car garage. The amenities for these spectacular condos are found nearby/across main street at Main Street Station which include ski/snowboard storage, shuttle service, an outdoor pool, hot tubs, fitness room, steam room, sauna and media room. Most owners of condos in Main Street Junction also have access to the Pioneer Club which is a beautifully furnished lounge area at Main Street Station with computers, televisions and space to relax. Owning a condo in Breckenridge Real Estate like Main Street Junction is great for the entire family looking for an in-town location but close to the slopes and an abundance of amenities. Start your search for condos for sale in Breckenridge CO online with us today.